An original American art form, comics thrill millions of people across the globe. Combining step-by-step instruction with expert tips and advice, Drawing Cartoons & Comics For Dummies is a one-stop reference for creating and marketing original cartoons and comics. 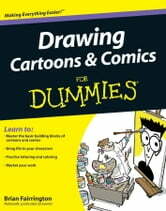 While many books tend to focus on specific characters or themes, this thorough guide focuses instead on helping aspiring artists master the basic building blocks of cartoons and comics, revealing step by step how to create everything from wisecracking bunnies to souped-up super villains. It also explores lettering and coloring, and offers expert marketing advice. The book's color insert provides guidance on how to add color to cartoon creations. So, You Want to Be a Comic Book Artist?